I have the best readers and sources – Pamela Wood. I have some stellar readers and sources. My readers and sources helped me with the "Where to Watch" box for this story. Whenever I ask for help, they always pull through. I’d like to think it has something to do with me — they trust me, they respect my work — but I’m pretty sure it’s really because they are passionate about the environment. For those who don’t know, ospreys are migratory birds that summer in the Chesapeake and winter in South America. They are distinctive-looking brown-and-white birds. They usually mate for life and nest in the same spots year after year — making them attractive to bird-watchers and nature-lovers. I’ve done versions of this story before, so I tried to make this one special. I decided to include a box listing good spots for osprey-watching as a little something extra. I started listing the places I know, but realized I was likely leaving out some great spots that I’d never been to or heard of. My newspaper covers a large geographic area, after all. 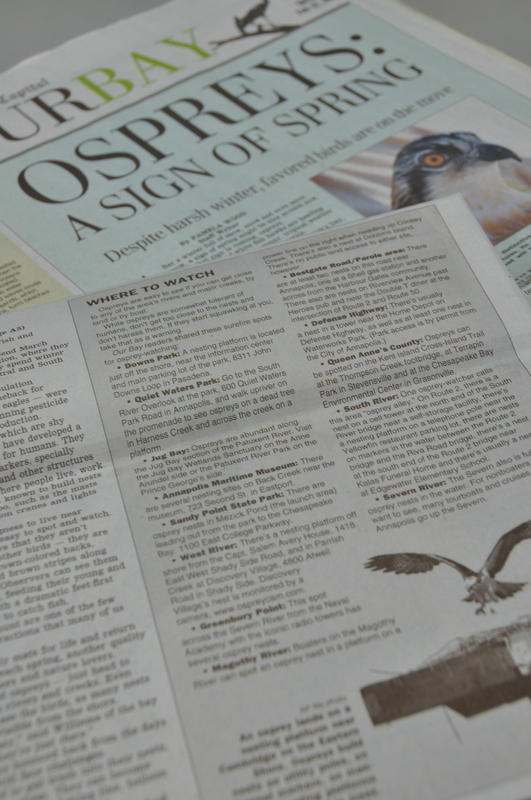 So I put out a call to my readers and sources for their favorite osprey-watching spots. I used Facebook, Twitter and e-mail. I got one or two responses apiece on Twitter and Facebook. I really hit the jackpot on e-mail, where I got 17 (!) responses. A good spot is at the South River Overlook in Quiet Waters Park. Go all the way down to the water and take a right, walking upriver on the promenade. Near the mouth of Harness Creek there are at least two seriously-used Osprey hangouts, one on a dead tree in the creek not far from the shoreline, and another, across the creek, in the water on a man-made platform. I couldn’t ask for better help than that! I guess the new-fangled term for this kind of experience is “crowd-sourcing.” Despite my embrace of new technology, I’m still an old-fashioned newspaperman at heart, so I hate using words like that. But whatever you call it, I’m happy it worked for me, and I think it made the story a little bit better. It’s YOU – yes, we are passionate about the environment, but how can anyone not want to help you?